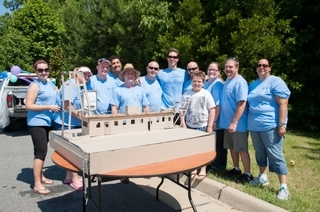 NEWPORT NEWS, Va., June 24, 2013 (GLOBE NEWSWIRE) -- Newport News Shipbuilding (NNS) honored its longstanding reputation by building an award-winning boat, this time made of cardboard instead of steel. NNS, a division of Huntington Ingalls Industries (NYSE:HII), competed against other Hampton Roads shipyards in FM 99's "The Yard" Ship Repair Competition on Saturday in Suffolk. With this win, NNS earned the right to call itself "The Yard" of Hampton Roads. Although most shipyards in Hampton Roads use thousands of tons of steel to build massive ships, at "The Yard" competition shipbuilders had to use creativity when given only cardboard, box cutters and duct tape. In just one hour, shipbuilders had to construct a life-like vessel that could float and even support additional weight. NNS' team decided to build Hull 282, Norfolk, originally built by Newport News Shipbuilding in 1925. This vessel, once used by the Navy to dredge out Subic Bay in the Philippines, is now immortalized in its cardboard miniature. Competitors' vessels were judged on three criteria: best resemblance to a naval vessel, lowest amount of visible duct tape, and heaviest weight endured for 10 seconds without sinking. The NNS team placed first in all three categories and even scored bonus points for successfully adding additional weight and a human to its ship. Overall, the NNS vessel held 344 pounds before sinking. "There is not enough praise for how well this team performed during the competition," said NNS team captain Stiles Bliss, an engineering technician in NNS' test engineering department. "Every member went above and beyond to make this endeavor a success. We put an awesome team together this year that embodied what our shipyard is all about." The boat-building competition was part of a community-wide event at the Hilton Garden Inn Suffolk Conference Center. Competitors and their families enjoyed foods, games and a raffle hosted by FM 99's Rumble in the Morning team.